This post will guide you how to swap contents of two cells in Excel. How do I swap cell contents with VBA Macro code in Excel. how to swap values between two cells in Excel. 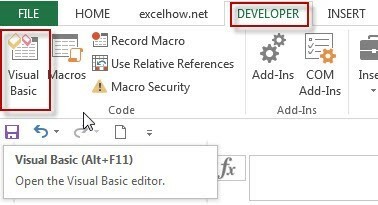 #1 open your excel workbook and then click on “Visual Basic” command under DEVELOPER Tab, or just press “ALT+F11” shortcut. #2 then the “Visual Basic Editor” window will appear. #3 click “Insert” ->”Module” to create a new module. 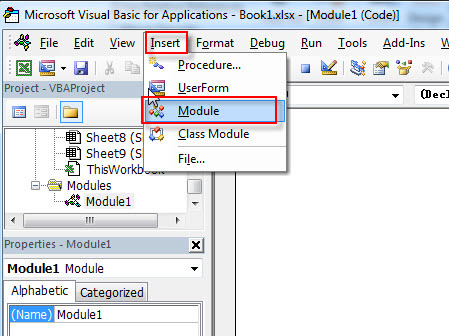 #4 paste the below VBA code into the code window. Then clicking “Save” button. #5 back to the current worksheet, then run the above excel macro. Click Run button. #8 Lets see the result.